Shed Boss barns have high roofs and long, flowing lines for aesthetic symmetry, making it perfect for anyone interested in creating a statement as well as a functional quality building. A good looking addition to any farm, acreage or larger residential property, our versatile range of heritage style farm sheds and barns improve the value of your property and give you plenty of space to work, keep animals or store large valuable assets. Featuring 100% Australian steel, your choice of heavy duty 0.42 BMT COLORBOND® cladding and the exclusive ShedBoss Morinda™ Knee and Apex joints -the Shed Boss Stockman barns are used as shearing sheds, calf sheds, horse stables, workshops, storage, animal husbandry or even residential living. Our traditional-style Shed Boss Stockman Barn is in fact one of our most popular and versatile steel buildings, available in a range of colours, heights and span widths. The Shed Boss Stockman Barn consists of the larger central bay (also known as a "parapet"), with a "wing" either side. The central bay is ideal for achieving the required height clearance for boats, trucks, caravans and motor homes, whilst the wings can also be fitted with roller doors for additional points of entry. Multiple front, side and rear entries. Shed Boss Fleurieu can assist you in identifying the best site on your property to build. For instance, say you need a space to keep your horses. Deciding which site works best is about more than just space requirements, you also need to account for things like the assessed site design wind speed and direction, and how best to maximise natural sunlight and airflow. After all, you probably don't want to live downwind of a group of animals, and ventilation and warmth are important for keeping livestock healthy. No two property owners are the same, and this should be reflected in how you customise your barn. For example, if your barn is intended to house a certain type of livestock, its design should be much different from a barn used to store heavy equipment. 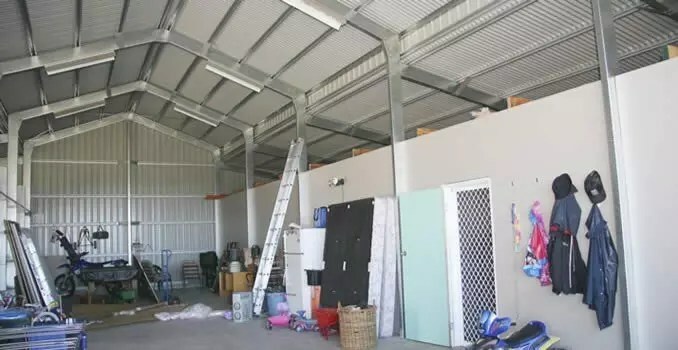 At Shed Boss Fleurieu, we can custom design the perfect barn to suit your individual needs and ensure your barn is effective and efficient for what you'll be using it for. Featuring wall skylights on the central bay, this Shed Boss Barn lets plenty of natural light in. From flowing lines to single, double or triple bays, modern steel barns can be customised with a number of details to better suit your requirements. Consider the overall width and length of your barn, how high you want its roof to be and whether you wish to divide the space using internal division walls. Also be sure to consider how many points of entry you want and whether a roller door would be preferable to another type. Finally, think about which colour of COLORBOND® steel you're in the market for. After all, there's no law that says all barns have to be boring! One of the features of a Shed Boss Stockman Barn is that the building can be divided into sections through the use of internal division walls. For example, you could enclose one wing of the barn to be used as a rumpus room, home office or studio. I chose Shed Boss Fleurieu to build my shed at Strathalbyn due to the overall presentation, professionalism and quality of product. My project manager Jim Kearns is a great bloke and provided excellent service. Shed Boss Fleurieu are the best shed builders in the business! Shed Boss Barn 12Lx12Wx2.4H This stunning Shed Boss Barn features COLORBOND "Deep Ocean" coloured walls and roof, with "Surfmist" trim and roller doors. The central (inner) span is 6 metres wide and 3.6 metres wall height, with an overall height of 4.69 metres to the apex. The span of each of the wings is 3 metres with a height of 2.4 metres. Shed Boss Barn 12Lx12Wx2.4H A Personal Access Door has been installed on the side of this Shed Boss Barn for easy access. Opaque skylights on the central span filters natural light throughout, matching exactly with the wall sheet profile of the MonoClad COLORBOND wall sheets. Shed Boss Barn 12Lx12Wx2.4H These two roller doors allow access for 3 vehicles, with the smaller roller door at 2.1 metres wide x 2.7 metres wide. The larger roller door is 3 metres high x 5 metres wide, with plenty of room for two cars, boats or caravans side by side. Shed Boss Barn 12Lx12Wx2.4H The pitch of the central inner span on this Shed Boss Barn is 20 degrees, perfect for installing solar panels. Shed Boss Barn 12Lx12Wx2.4H Roller doors can be automated with remote control auto-openers. Shed Boss Barn 12Lx12Wx2.4H If longevity is a key focus for you, you'll be happy to know that installing concrete flooring means you'll have a quality, long-lasting floor. This can help you ensure your barn stays in good condition over time. The material is extremely sturdy and can withstand a great deal of force and impact without showing the slightest sign of weakness. Shed Boss Barn 10.5Lx10Wx2.4H This rural Shed Boss Barn features COLORBOND "Shale Grey" roof, “Classic Cream” walls with "Manor Red" trim and roller doors. The central (inner) span is 4 metres wide and 3.6 metres wall height, with an overall height of 4.33 metres to the apex. The span of each of the wings is 3 metres with a height of 2.4 metres. Shed Boss Barn 10.5Lx10Wx2.4H This Barn has 2 x Personal Access Doors each on the front and side, a central 3 metre high x 3 metre wide roller door and a 2.1 metre high x 2.7 metre wide roller door. Short wall sheets of translucent polycarbonate skylights are ideal for letting plenty of natural light throughout. Shed Boss Barn 14Lx12Wx2.4H This Shed Boss Barn features COLORBOND "Woodland Grey" roof, walls, trim and roller doors. The central (inner) span is 6 metres wide and 3.6 metres wall height, with an overall height of 4.69 metres to the apex. The span of each of the wings is 3 metres with a height of 2.4 metres. Shed Boss Barn 14Lx12Wx2.4H From flowing lines to single, double or triple bays, modern steel barns can be customised with a number of details to better suit your requirements. Shed Boss Barn 10.5Lx10Wx2.4H This Shed Boss Barn features COLORBOND "Surfmist" roller doors and trim, with “Pale Eucalypt” , walls and roof. The central (inner) span is 4 metres wide and 3.6 metres wall height, with an overall height of 4.33 metres to the apex. The span of each of the wings is 3 metres with a height of 2.4 metres. Shed Boss Barn 10.5Lx10Wx2.4H From left to right: a heavy duty Personal Access Door; 3 metre high x 3.43 wide roller door and a 2.1m high x 2.75 wide roller door. Shed Boss Barn 10.5Lx10Wx2.4H Whether you need to house animals or store valuable assets like farming equipment, a modern, well-made barn can meet your needs and add value to your property. Shed Boss Barn 17.5Lx18Wx3H This Shed Boss Barn features COLORBOND "Evening Haze" roof, trim and roller doors with “Pale Eucalypt” walls. The central (inner) span is 6 metres wide and 4.5 metres wall height, with an overall height of 5.59 metres to the apex. The span of each of the wings is 6 metres with a height of 3 metres. Shed Boss Barn 17.5Lx18Wx3H Shed Boss barns have high roofs and long, flowing lines for aesthetic symmetry, making it perfect for anyone interested in creating a statement as well as a functional slice of lifestyle property. Shed Boss Barn 17.5Lx18Wx3H This central roller door has a height clearance of 3.6 metres and 5.1 metres in width. Shed Boss Barn 17.5Lx18Wx3H One of the features of a Shed Boss Stockman Barn is that the building can be divided into sections through the use of internal division walls. For example, you could enclose one wing of the barn to be used as a rumpus room, home office or studio. Shed Boss Barn 17.5Lx18Wx3H Creating a luxurious, minimalist space is easy and the features of Shed Boss barns make them perfect for lifestyle properties. How can a shed help your hobby farm?